Over the next 20 years, concern about sustainability, climate change and health will push many of the world's largest cities to curb car use, partly through making cycling easier and safer. But by 2025 the UN predicts this total will rise to 37, with the addition of nine new megacities in Asia. All but eight of these 37 will be in the developing world – where the quality of life for hundreds of millions will be partly determined by the ease with which they can travel and commute through densely-populated, sprawling conurbations. Last year, I was awarded the RIBA Norman Foster Travelling Scholarship to examine at street level how urban public space is being shaped in developing-country megacities to foster a mass culture of cycling. 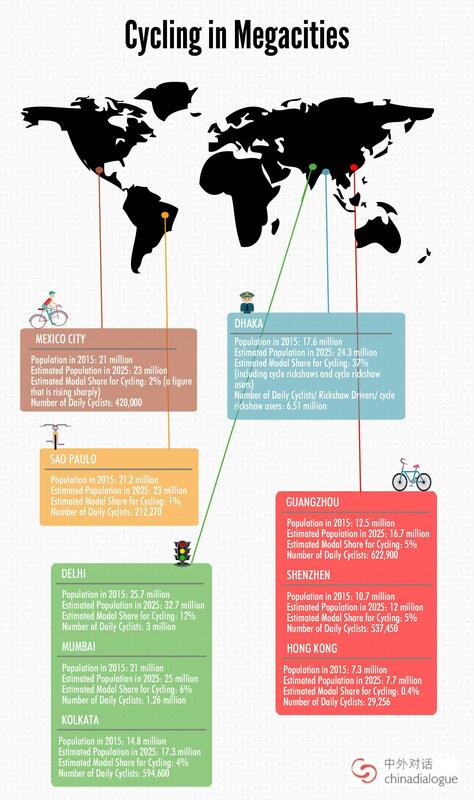 Below, I examine which steps cities in Latin America and Asia have taken to promote mass mobility by bike (and increase what planners call 'modal share', the percentage of journeys done by a particular mode of transport). I also look at the challenges urban sprawl poses for planners, policymakers and cyclists themselves. These challenges and dangers have stimulated a shift away from the 20th century ‘modern ideal’ of a car dominated future. Meanwhile, mayors all around the world are looking for alternative strategies on how to move masses of people around their cities. It would be an urban area that is growing and changing rapidly but where expansion and fast-paced development is not overwhelming to commuters. A city where everyone can move freely at no extra cost, where commutes aren't ruined by pollution and overcrowding. Where the city helps keep residents healthy; where people are more productive at work; where people live longer lives; and where people are happier. 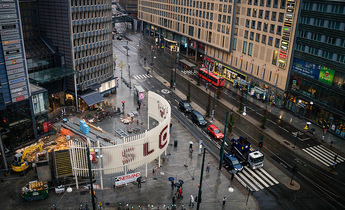 At present, most of the world's cycle-friendly cities, such as Amsterdam, Berlin, and Copenhagen are much smaller than megacity scale, and tend to be located in northern Europe. Sao Paulo, South America’s largest city, is famed for being one of the most car-dominated and polluted urban expanses on earth. However, over the last two years, the city has seen a rapid development of cycling infrastructure, and new generation of young professionals who live in central districts, the areas of the city that are focal point for this change. Here it feels relatively safe cycling along the Faria Lima cycle path - a segregated route running through the middle of a six lane road. Here you will find a perfectly smooth ride and fantastic views of the city, where people cycle along at a gentle pace shaded by trees. However, its benefits are limited. It is not a route used by people to get to work, nor is it easy to access because it is in middle of a busy avenue, requiring cyclists to find junctions to enter it. Nonetheless, these types of lanes have transformed the way the city's residents can move within, and engage with, Sao Paulo. Other painted lanes run through the city centre following more commuter friendly routes although the obvious higher investment in the recreational cycle lanes question the city’s intentions of becoming a truly cycle friendly megacity. Because Sao Paulo's inner ring road is such a big physical barrier to traverse for cyclists commuting in from the suburbs, city planners envisage a 'multi-modal' approach. For example, a commuter in a distant suburb could use a bike to get from their home to the nearest metro station and use mass transit for most of their journey. Once in the centre, they could revert to two wheels through a shared cycle scheme. With more than 20 million citizens, Mexico City is one of the largest and fastest growing cities in Latin America. As wealth increases alongside population numbers, more people can afford to drive and live a sedentary lifestyle, adding to the city’s chronic congestion and pollution epidemic. 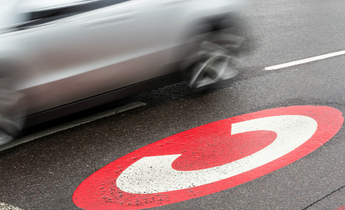 The average daily commute by car has lengthened to over three hours. Mexico City residents are losing personal space, time and their well-being because of worsening traffic jams. But cycling here has been documented to deliver far-reaching physical, mental, social and health benefits – regardless of age and income. The moderate climate and predominantly flat terrain in Mexico City is perfect for cycling. Studies have also shown that 50% of all trips made in Mexico's capital are less than 8 kilometres - so 50% of all trips done in the city could be done by bicycle. So in 2007 the city’s environmental department – La Secretaría del Medio Ambiente – put together a strategy to encourage cycling. Since then, one of the largest and most successful bicycle share systems on the planet has been established - Ecobici, over 50 kilometres of segregated cycle paths and 15,000 bicycles have been put in place. This has completely transformed the perception of cycling in the city and many now regard it as a viable option for their daily commutes. In addition to these changes in infrastructure, social development has transformed the perception of cycling in the city. Stand on Mexico City’s grand Paseo de la Reforma boulevard on a Sunday morning and you will hear gears whirring, bells ringing and the chatter of voices as 50,000 people cycle, skate and run along 56 kilometres of closed roads. Stop and listen on any other day of the week and all you’ll hear is the roar of 10 lanes of traffic. For a few hours every week, pedestrians and cyclists can use a big stretch of road free from cars. Hong Kong, one of the most compact urban environments on the planet, has densities of up to 50,000 people per square kilometre. Of the world’s top 100 tallest buildings, 34 are currently in Hong Kong and this vertical city continues to grow upwards with relatively little expansion outwards, as the city is hemmed in by mountains and the sea. One might then expect high numbers of people walking and cycling - but despite commuting distances of less than 8 kilometres, these figures remain remarkably low. In many ways Hong Kong could be a fantastic megacity for promoting cycling culture; the incredible density means that most journeys are under 5 kilometres, the limited space means that car parking is restricted and new areas of the city are being built on flat reclaimed land. However, there are many more factors that are stopping people from cycling. The weather is very humid - so unless there are shower facilities at destination points, commuting by bike isn’t a very attractive proposition for many. The density means that road space is very limited and cars are given priority over any other type of transport. 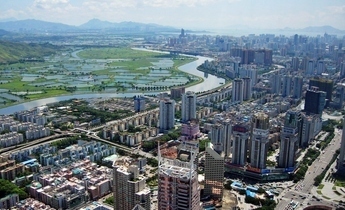 Chinese planners hope to merge nine cities in the Pearl River Delta (from Guangzhou to Shenzhen) creating a 41,000 square kilometre urban area, 26 times larger than Greater London. Over the next six years, 1.5 trillion yuan (US$229 billion) will be spent integrating transport, energy, water and telecommunications networks in this combined urban area. 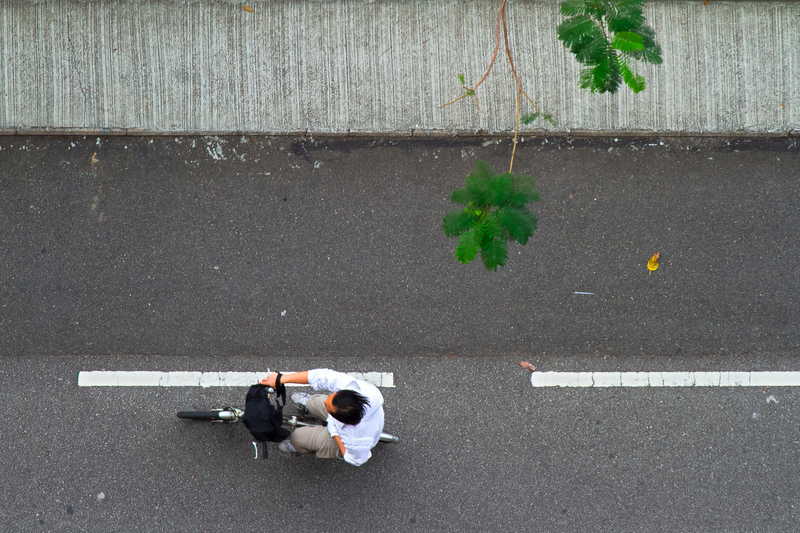 But in Shenzhen, the options are limited for cycling to play a central role. At first glance, Shenzhen was a great surprise and a welcome contrast to Hong Kong. Shenzhen has a decent network of cycle paths and many bike share systems, depending on the neighbourhood. Despite some major obstacles, modal share of cycling has increased over the last 10 years. But the main problem is the grid of highway-style avenues that divide most of the city up into a grid or regular sized blocks, which mean cycle paths end at busy roads that are difficult for cyclists to cross. The city's rapid growth has lead to a patchwork urban fabric where many neighbourhoods are disconnected from each other. It can take half an hour to walk or cycle 50 metres across these large roads and residents often use taxis just to move to adjacent neighbourhoods. While there is a culture of cycling in some areas, they cannot spread to others. The only exceptions are where there are rare pedestrian/cycle underpasses, which have become busy transit corridors, especially for delivery bicycles and electric bikes. This has resulted in Shenzhen having five different bike-share systems, a cycle network only in certain zones, and cycling infrastructure that keeps bicycles completely separate from roads. These all limit the types of journeys Shenzhen's cyclists can make. 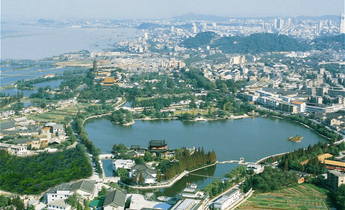 Guangzhou is the third largest city in China and is continuing to grow rapidly. Unlike Shenzhen, which is only 40 years old, Guangzhou has an old historic centre. This area was self contained up until the mid-20th century when rapid urbanisation and a huge population boom prompted the city authorities to demolish the ancient walls and expand. Since then, a second ‘new town’ has been built to the west of the old city. In these areas, high rise tower blocks are connected by vast avenues that can be as wide as 12 lanes. The stark contrast between the past and the present makes Guangzhou a fascinating place to study how urban design determines how people move around. As expected, the old town is busy with bikes and pedestrians, but buildings are small and parking space at a premium. Many people choose to commute from areas where they have more living space. Even though the old town's streets are crooked and narrow, the area is relatively congestion free because of a strict one-way system, and curbs on traffic flow. Wuyangs – bicycles that were much sought-after during the Mao era – are a common sight in the old town, and the factory that makes them is located just outside the city. 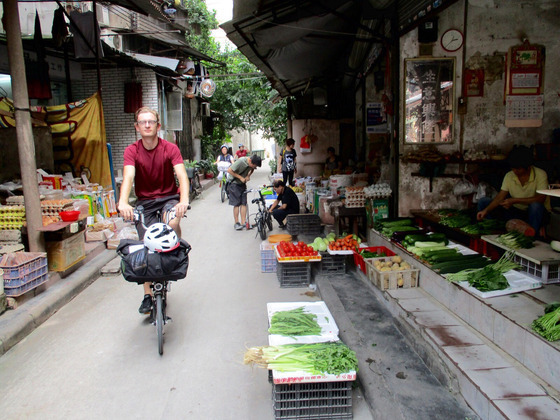 The narrow streets, the density of five-to-six storey buildings and lively street life are what makes Guangzhou's historic centre appealing for cycling, and difficult for most other forms of transport such as cars. The new town, by contrast, is desolate and unspontaneous. Its skyscrapers, vast public plazas and wide roads. are a markedly alien environment compared with the old town's cycle-friendly layout. Over the past two decades, Kolkata’s rapid suburban expansion has contributed to increasing congestion on the city's roads and the city's planners dealt with it in a unique way, banning cycling rather than encouraging it. Kolkata's authorities prohibited cycling in the city centre in 2014 because they believed bikes were a major cause of congestion. Widespread protests by civil society prompted a partial relaxation in some areas but the anti-cycle signs remain in place and the police continue to fine cyclists in much of the city centre. This crackdown signifies the low social status of bicycles and cyclists in Kolkata, yet getting on a bike would be the quickest way to move around the city and is heavily embedded in the city's social history. The chaos, lack of rules, busyness, noise, colour, vibrancy, smells and culture found on the streets of Kolkata are overwhelming. There are no bicycle lanes, and bikes have to share the road with cars, rickshaws, lorries, and cows, which have a sacred status in India and can be seen wandering around major cities. However cycling here feels surprisingly safe. Commuter distances are long and the main motivation of cycling in India – financial necessity – isn't a major issue for the middle classes, who can increasingly afford cars. But 30% of Kolkata’s population are slum dwellers and for this large population, safer and slower roads would support a culture of safer bike use. 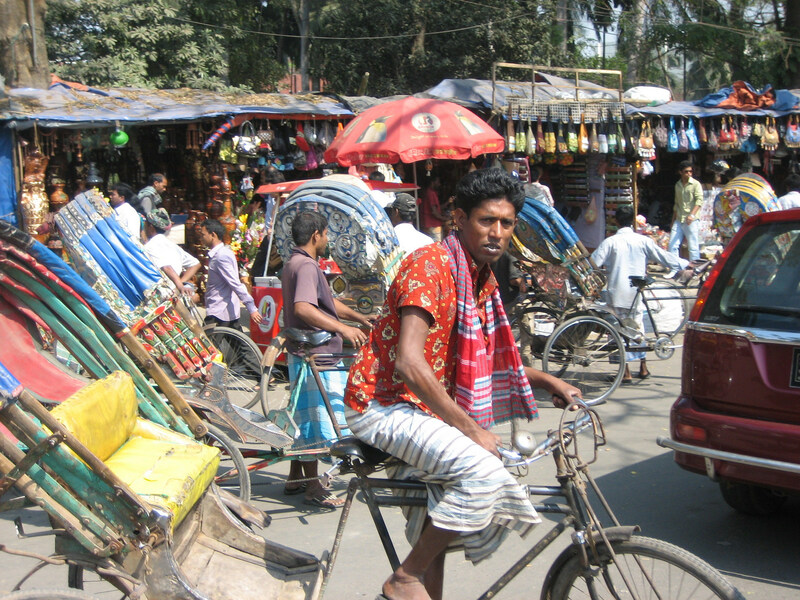 Dhaka is a megacity with over 600,000 cycle rickshaws. Every day its residents use pedal power to get around. However the rickshaw drivers, and others who are forced to cycle out of necessity, are usually amongst the 40% of the population that live in slums. The city has a number of designated rickshaw lanes and paths in a bid to ease the flow of the three-wheel pedal powered taxis that spread across the city, but otherwise there is no supporting infrastructure for cycling. It feels less safe than Kolkata, mostly because of the higher percentage of trips taken by auto-rickshaw, which are motorised vehicles that weave unpredictably in and out of traffic. 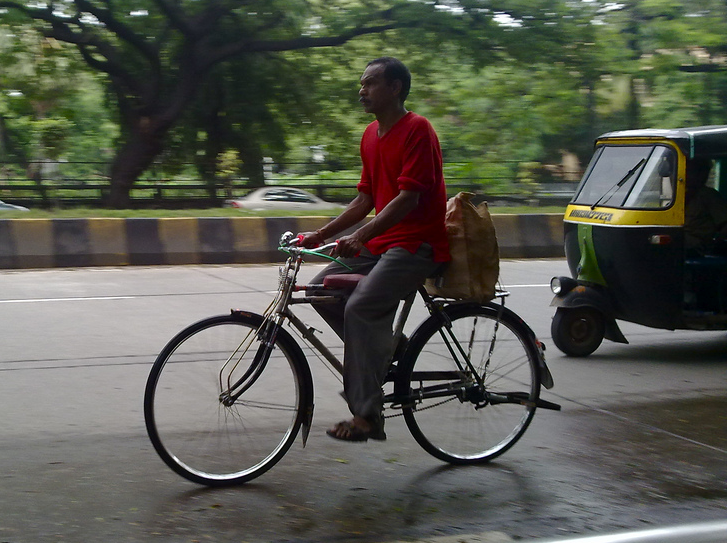 Cycling and the cycle-rickshaws are seen as outdated and undeveloped modes of transportation. Dhaka's new five year plan, which is heavily promoted by the World Bank, prioritises highways, extends parking space and creates more road space, but the question arises as to whether the city can cope with a big inflow of cars. 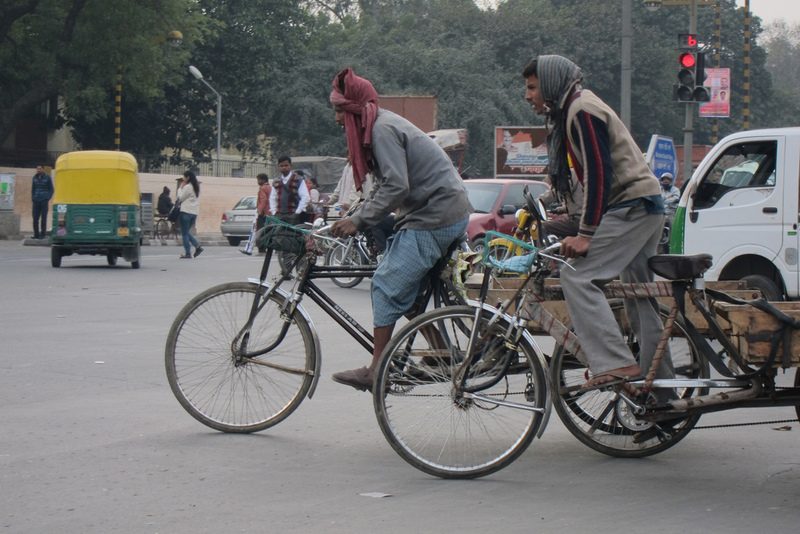 Currently only 5% of people use private cars, compared with 37% who use cycle rickshaws. The government will spend US$10 million on pedestrian facilities, while the budget for flyovers will be US$1 billion. Activists are complaining that the plan favours the suburban middle classes over the urban poor. Delhi is the fastest growing city in India and one of the world's most polluted, and over half a million people migrate from rural areas to the capital every year. To handle this pressure, Delhi follows the urban model seen in China, and until fairly recently, was favoured in western countries. This model, largely based on cars, highways, high-rise residential suburbs and a massive consumption of energy, isn't an appealing environment for cyclists. In addition, the large avenues and grand urbanism favoured by the British colonists continued to find favour after independence. Since the 1950s, the urban development of Delhi has spilt outwards, seemingly uncontrolled. As seen elsewhere, the old city – dense with small streets – is where cyclists are most likely to be on the roads. Until recently, beyond the old city there were no dedicated cycle lanes and the city's main focus in the past few decades has been on a new metro system and a BRT (bus rapid transport) system. The BRT aimed to use a fast-lane to whisk commuters to work along the lines of similar projects in Bogota and Johannesburg. But in Delhi, the venture, now scrapped, was deemed a failure because cars often strayed into bus lanes and bus stops were too few to be of practical use to many commuters. Meanwhile, Delhi's worsening traffic has prompted bicycle lanes to be commandeered for use by small cars and rickshaws, prompting a backlash from some green transport campaigners. ​Mumbai is one of the economic powerhouses of India, but also with some of the largest slums in the world. The city is home to many international companies and is home to commercial zones and has seen a huge rise in car ownership. This has resulted in a built environment that spreads out along specific avenues inland, along the coast or along the peninsula where much of the city is concentrated. Such a densely-populated environment has led to worsening pollution, while smog now plagues much of the city and surrounding bay - making Mumbai one of the unhealthiest cities in this study. Cycle routes are rare, located mainly in parkland areas that are badly maintained, poorly lit and generally regarded as unsafe places to be. The city's planners don't appear to officially recognise cycling as a means of transportation, despite a relatively high share of overall transport. Despite rising pollution, dangerous streets and rapid urban growth, there has been a big increase in recreational cycling and a rapidly growing cycling culture. Tax gas guzzlers and use some of the money to build safer and better bike lanes. Offer financial rewards to commuters who ride bikes rather than drive a gasoline-engine cars. 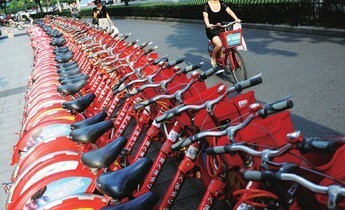 Guangzhou has one of the world's largest bicycle sharing systems. It has over 2,000 km of greenways, which make cycling across the entire metropolitan area relatively easy. How did the author miss this?